Drones. Whether you love 'em or hate 'em, they're here to stay. But while consumer drone enthusiasts fret over the unfeasible possibility of civilian-operated drones eventually being banned worldwide, there's a fast-growing UAV industry focussed entirely on saving lives and the planet. Rescue services are already using UAV's to monitor building fires, traffic accidents and the like, and farmers even use them for counting sheep. But these applications are just a scratch on the surface of what these autonomous air bots are capable of. Which is why next week, the Dubai-based 'Drones for Good' award ceremony plans to give away $1 million to the winner of the 'best use of drones to public services and improving people's lives'. NASA physicist Lauren Fletcherhas eyes on the booty with his proposed industrial tree-planting escapade that uses autonomous drones to fire nutrient-rich seed pods into the soil. A weapon of sorts, granted, but at least for the good of mankind. Unlike landmines, which blow your legs off for no reason. If CatUAV has its way, landmines will be a plight of the past. The company is proposing a UAV system that can detect and map landmines from the air. And that's got to be better than using a long stick. Given that most of the world's civil aviation authorities are just as concerned about drones falling out of the sky and landing on people's delicate heads as they are about idiotic members of the public flying UAVs over major airports, Patrick Thevoz's Swiss company Flyability may have come up with an ingeniously simple solution: a small, lightweight and almost entirely autonomous camera-carrying UAV that has the unique ability to collide with obstacles – and people – and continue flying. 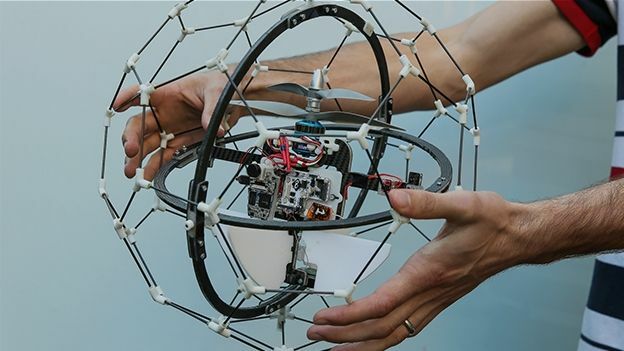 The Gimball drone is surrounded by a flexible orb-shaped cage that protects the props from harmful impact while alleviating the need for anyone to pay a visit to the A&E department. The design is not unlike that of Parrot's Rolling Spider toy drone except Thevoz's plan is aimed more at the search and rescue industry. He mentions the tsunami destruction of Japan's Fukushima Daiichi nuclear power plant as an example. 'This is the first robot to be able to enter the heart of a disaster like that in Japan', says Thevoz. 'It can actually use collisions to its advantage by having the obstacle guide it'. If we were judging the contest, this idea would walk it. From small concepts to giant ones. Mouza Al Shemaili's grand plan is to use a fleet of drones to dissipate fog over airports and in cities. Cloud seeding isn't anything new but using a fleet of drones to disperse the chemicals – usually sodium chloride – certainly is. Al Shemaili and his team have already carried out a successful laboratory test. Whether the system can be applied to controlling something as humongous as the weather remains to be seen. Donor organ transport is another item on the agenda and Dronlife thinks it has come up with a solution. Using drones. It's a commendable idea, we thinks, but given the current unreliability of drones in flight – batteries failing, motors seizing, etc – it's also a wee bit optimistic. 'Has that donor heart arrived yet, Dr Fosslethwaite?' 'Er, no, it's currently dangling 50 feet up in tree'.